When you’re trying to come up with activity ideas that your baby or toddler can enjoy, sport isn’t likely the first thing that comes to mind. However, baby and toddler sports are really taking off and they come with a range of great benefits. Now, obviously babies and toddlers have very limited abilities. So, the sports they can partake in are tweaked to match their age. However, the range of movements really provide a lot of benefits that can help your child when they’re slightly older and they start sports lessons in school. Here, we’ll look at the benefits you can expect when you encourage your little one to take part in baby and toddler sporting activities. Perhaps the biggest benefit of baby and toddler sports is its ability to really boost development. It can help aid in both fine and gross motor skills, especially if you opt for activities such as yoga. Baby yoga has become extremely popular and it isn’t hard to see why. They are naturally bendy, find it easy and enjoyable to partake in the classes and it delivers so many benefits. If there’s just one sport you choose for your baby, yoga would often be the best option. This benefit alone is likely to lead you to book your little one in for sports classes and activities! Both babies and toddlers are renowned for their sleep issues. It’s one of the most difficult problems to resolve and can cause a lot of stress, anxiety and frustration, not to mention sleep deprivation. Sports activities use up a lot of energy. By the end of the day, your baby and toddler will be worn out, increasing the chances they’ll sleep better. If you take your toddler to an actual sports group, it’s going to help them build up their communication and social skills. They’ll get to interact with other toddlers, as well as adults, and learn more about communication. There will be instructions to follow and the sad truth is, toddlers are often more likely to listen to another adult, than they are to their parents. So, there’s more chance they will actually take part and follow instructions if someone else is giving them. Sports groups specifically designed for toddlers can really help boost your little one’s confidence too. If they are naturally shy, the group will help them to interact, socialize and communicate with others in a gradual way. Whether you decide to add sports activities to your little one’s schedule at home, or in a group setting, you’re going to need to help them and join in yourself. This can really strengthen your bond and help you to spend quality time together. Both babies and toddlers enjoy one-on-one time with their parents and crave attention. So, if taking part in sports helps them to achieve that, they’ll look forward to the sessions. Whichever type of sport activity you choose for your baby or toddler, it’s going to help improve both focus and concentration. This benefit won’t be immediately noticeable, but will start to really show once they start school. The long-term benefits of increased focus and concentration include achieving better grades and an improved ability to absorb more information. While sporting activities can have some pretty impressive benefits for babies and toddlers, there are a few things to keep in mind. Firstly, it’s important not to push your child to do more than they are capable of. If you push them too hard or make the sessions last longer than they should, it can lead to some pretty epic tantrums. Obviously pushing them harder than they can handle will also pose a risk of injury. So, always keep your child’s abilities in mind when determining which sporting activities to partake in. Please remember that this is meant to be an enjoyable and beneficial activity for them, not a competition. Another thing to consider is not all classes will be right for your little one. It’s a good idea to go along to a class just to watch, before you decide whether it’s worth trying. Overall, sports aren’t just for older children – they can have some pretty amazing benefits for babies and toddlers too. In a digital age where more time is spent in front of a TV or Smartphone screen, it’s good to encourage your toddler to partake in physical activities. 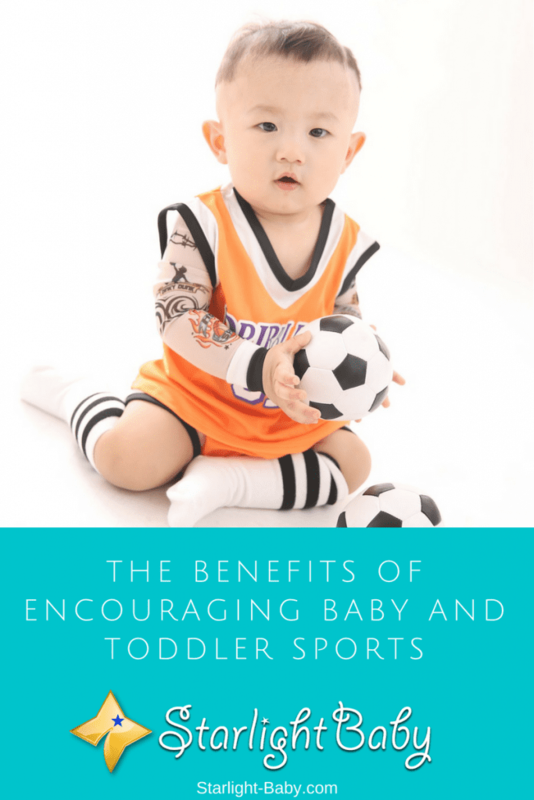 Have you enrolled your baby or toddler into a sports class? How did it go? Share your experiences below! Have You Created A Summer Toddler Bucket List Yet? I am a big advocate for singing up your toddlers to different sports activities. When I was a child, as soon as I could walk and talk, I began doing sports. I did everything from football, to basketball, at 6 years old I even began skiing and more. It had such great benefits on me and my personality – it taught me how to communicate, work with others, it gave me a different perspective about teamwork, made me more confident and more! This is also why I have already signed my boy up for football. He is just old enough to join one of the youngest groups at our local football club and he already went 7 times. They have ”practice” every week, twice per week.. He absolutely loves going and he already made so many new friends. They have a special program that is adjusted to the age level of toddlers and it is truly great. Another good thing is that he ends up sleeping like a rock! I’d highly recommend enrolling your toddlers into sports activities as soon as they’re old enough. Wow, that’s awesome! I’m a bit jealous of all of those opportunities you got to experience so young. I still haven’t gone skiing, and I really want to! As you say the benefits are plentiful and team sports like that offer a lot of additional benefits on top of that. It sounds like he’s having a lot of fun and you’ll come to see a lot of those same benefits you experienced as a child with him as well. Not to mention, some of these great traits and habits are carried with you all throughout your life. I attribute a lot of my love for exercise and drive to push myself to the fact that I often went mountain biking with my father as a child. As long as you don’t overdo it, don’t pressure your children into doing things they don’t want to do or act like it’s a competition, the benefits are enormous and the drawbacks are very few. Really appreciate you sharing you and your family’s story Jane! Yeah, I honestly had great opportunities all through my childhood, especially regarding sports. Both my parents were really, really huge lovers of such activities. Both of them played basketball in clubs and so on. I guess the love of sports, in general, was transferred to me. You really should try to ski at least once in your life. I assure you, you won’t regret it 🙂 when you will start skiing down that slope, you will experience an incredible feeling of freedom! And I completely agree with you that these traits and things that you learn/get to experience as a child while doing sports stay with you even as an adult. This is why I always supported it. No problem James. I always enjoy sharing my experience with others and hopefully, it gives them some valuable information or at least keeps them entertained! Great question Eustace! Soccer, swimming, gymnastics, baseball, dance etc. are all popular options. Of course, these are toned down to make them both safer and more enjoyable for toddlers. i never realized how many benefits there were to putting toddlers into sports. I think putting my 2 year old into sports is something i will consider doing in the near future. This is a great idea! I have three year old nephew who is very hyper. He loved throwing things anywhere and liked running around. This is stressing me out everytime I babysit him. This give idea to enroll him to sports. Since he loved throwing things I might consider basketball or baseball for his sports. Making him busy in this sports might help him to drain all his excessive energy that will knock him out at night without his mom chasing him first. You’re so right there, Rose. Enrolling your nephew in basketball or baseball for toddlers will drain his excessive energy and knock him out for sure, haha. I could just imagine how stressful it is for you when you babysit him. Now you know what to do, haha. Exercises and physical activities are great for babies and toddlers. Once a child starts walking, the first thing he/she wants to do is to race around! Some sports are also more popular than some. Parents sign up their babies for swimming lessons from as young as 6 months old. Another popular sport favoured by parents is Karate. The debate is often around the question of how young is too young to let a baby or toddler be involved in some sporting activities. But in all, everyone agrees sports is great for babies. I guess when it comes to sports, a parent will be able to gauge what his/her baby or toddler can do. I believe all babies/toddlers are different and each has a different skill set. It’s probably a good idea to let the child try several sports. If you can see he/she is really interested in one of them, you can have him/her join that sport. As a father of a four months old baby, I have already noticed that how much a child loves playing. My baby is annoyed when he is left alone in his cot, however, smiles and makes happy noise when somebody is around. I have already introduced some toys to the baby. The baby likes to watch how the sound or light are created by these toys. Haha, I’m not surprised hearing that you baby become annoyed when left all alone. Mine would start fussing and if you don’t attend to him immediately, he would start crying immediately. It’s amazing how babies crave attention and playing, it’s actually good for their all round development. I have always known the benefits of sports and exercise both to Kids/toddlers and adults otherwise, the information you provided here is quite accurate and very helpful to kids development and even health care. But woe to most African parents, especially Nigerians, they would entertain having their kids or toddlers to engage in sports with the useless superstition that someone would bewitch their kids. I just feel helpless most times our people wallow in ignorance. I enjoyed playing football while I was still a kid and that helped me build bonds with my friends then that it got to the extent that I cry each time mom doesn’t allow me to go play football. Participating in sports while a kid also brough out the best in me as regards pushing to become the best. So, I can really identify with the benefits of partaking in sports as a kid. Sports and exercise is good for both kids/toddlers and even adults as well. It helps with the maintaining and encouraging of good health in keeping fit and entire body development and growth. Sports encourage team spirit in kids because it would get them to work hand in hand with one another and effectively carry out the Sports activities successfully. Am a big sports lover and in saying so it means am definitely going to agree or advocate for toddler sports sign up. My parents do the same for me when I was growing up and I can’t even begin to state ho much I benefited from it. It was really helpful and I enjoyed every bit of it. It kept me busy often and i never had time for any unimportant activity. It also afforded me the chance to get enough rest as it seemed to always make it fall asleep shortly after i tetutned home. Now thats why i loved the tip on sleep. Good article i must say. having toys at the side of your baby has many benefits. If your baby is at the crawling stage, a ball can help him practice crawling. When the ball rolls and the baby crawls after the ball, the baby will not only become happy but also perfect his crawling skills. If your baby is at the walking stage, letting him play sport will improve his walking. I tell this from my experience.